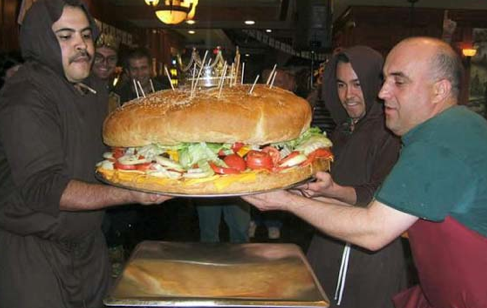 How far would you have to run to burn off all the calories from this burger? This is a slight remix of a traditional calorie problem in a math text. Bascially I first show the students 4 burgers with the calorie count blacked out, and have them guess what it is for each burger. Then I ask them to figure out how many miles they would have to run in order to burn off the calories from each burger. Runners use the general rule of thumb that you burn 100 calories per mile. You might what to use that fact for something – maybe ask them for what weight is that actually true. – The problem asks students to use their weight. I offer up my weight and ask if some students could help me by doing the calculations for me. That way they can choose to do it for themselves or me. – I do not initially give them the relation for calories burnt vs. miles. I make them request that information based on their need to solve the problem. 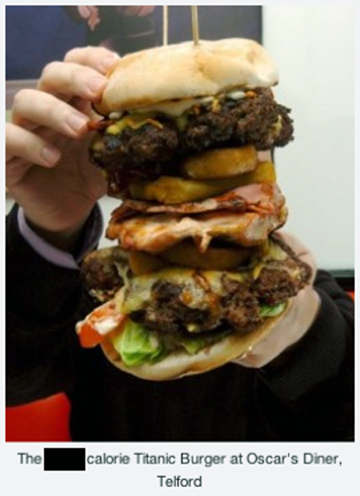 How many times around the track would you have to run to burn off this burger? This burger is called “The 8th Wonder”. Although the calories of it have not been calculated, we know it’s 105lbs. I have the students use the fact that “The Beast” is 15lbs and 18,000 calories. Discuss with them if a linear model is sufficient for this calculation. Instead of getting the joke – I gave a Long Form. Here’s what the student wrote. Daniel (not his real name) asked for a Short Form, so I gave him a Long Form. I should have laughed it off because it was not actually a problem. Not every behavior is a problem that needs to be dealt with. I did not get the joke because at the time Daniel and I were experiencing two different classrooms: I was experiencing one where a student was challenging my authority and disrespecting me. Daniel was experiencing one where he was making a light-hearted joke to a favorite teacher. Both realities cannot be true at the same time. I do not know for him, but my perception was altered by the fact that I was still frustrated by the actions of another student a few minutes prior. 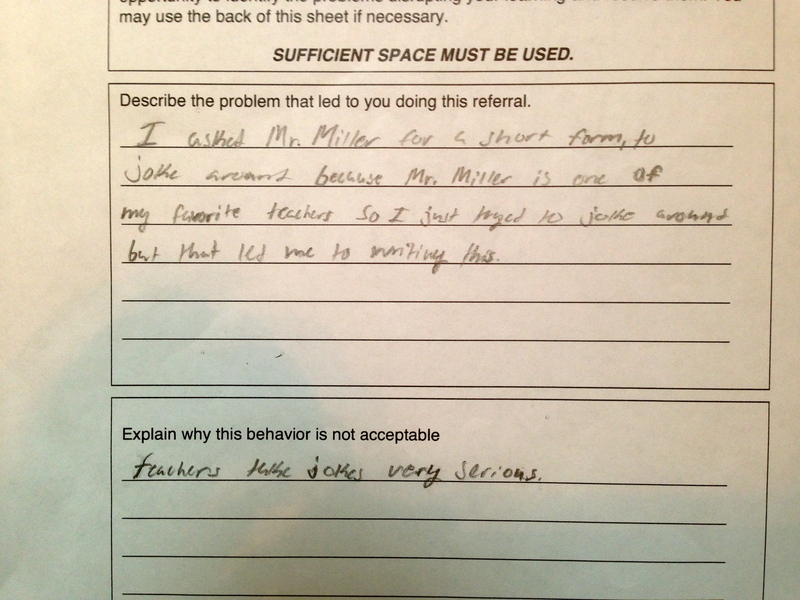 I was upset and probably waiting for a student to do anything that would allow me to show my authority. A class has a certain vibe that you just have to feel in order to make good discipline decisions. You have to know when to act, when to laugh, when to give a referral, when to give a Short Form, or when to let it slide. It sounds like a daunting task but it’s not – at least it’s not if you don’t overthink it. Basically you just need to be in a good mood and you’ll make good decisions. In teaching there are moments when you have to laugh. There are moments when you have to get the joke. 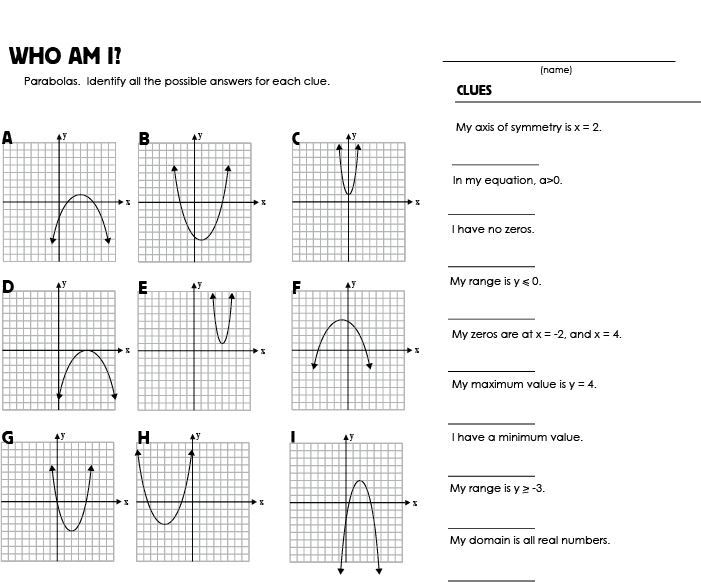 Here’s another ‘Who Am I’ style worksheet. I posted a few others a while back, which you can find here. Some of the clues are intentionally general, and thus will have multiple answers. The students must list all possible answers. 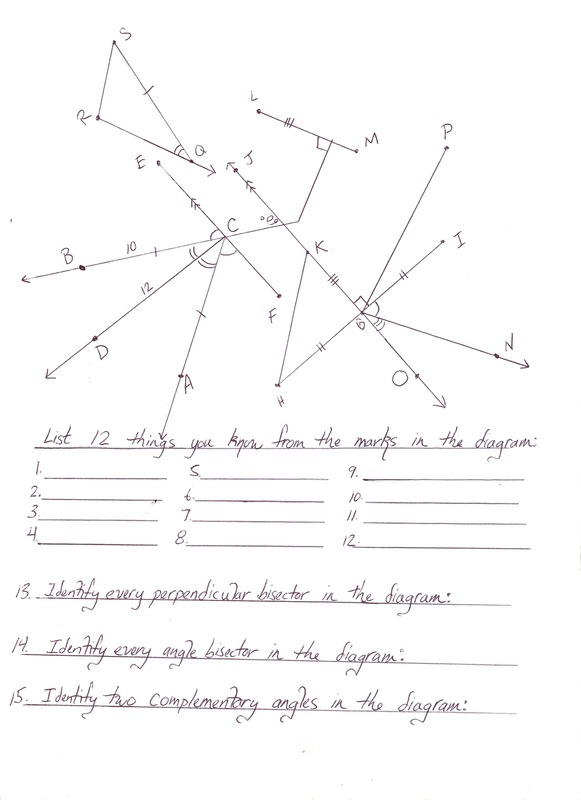 I used this worksheet the day after playing Quadratic Taboo.